We are educators and information specialists, and we need to stop comparing ourselves to Internet search engines. 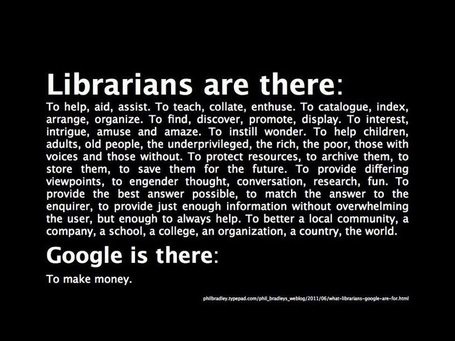 I agree with everything this constantly circulated graphic says about what librarians do. However, I hate that the focus of the message shifts in one simple sentence from librarians to a company that provides tools that many librarians and library students use in their information seeking practices. This change in focus is off-putting, and it disconnects us from the users we are trying to reach. Whining about how we do so much for you and how Google just loves you for your money makes us sound downright petulant. Evidence-based practice and a user-centered advocacy message will go further and have more impact than demonizing Google. Interested in learning more? Check back throughout the week to learn more about evidence-based strategies you can use in your school library, and for examples of user-centered advocacy pieces that could carry a big impact for your library community. I couldn’t agree more with you, Kate. I really do dislike that graphic. You said it very well!